The life of a tower climber is not one for many. It is a highly specialized occupation that requires focus and precision. What if you had the kind of job where you had to climb thousand foot structures on a daily basis for major cell phone carriers that care more about money than they do about your well being? Instead of being in the trenches with the thousands of tower climbers, these corporate professionals can more likely be found in the board room or on a corporate jet totally detached from the realities of the industrial hazards and pressures. I think time is the worst factor because it wears down the mind in an insidious manner. Work environments vary and all are extreme. There are many factors at play that when all combined could result in a catastrophic injury. Workers climb on a daily basis so they are very confident about doing their job, which could lead to a serious lack of judgment that could result in fatalities. Tower climbers are well aware of the choice they make when they decide to climb towers. A major precaution is when you get comfortable doing something, almost with everything, it is human nature to relax and take shortcuts, as you find ways to get results regardless of unfavorable conditions. In other words, it is human nature to push the limits and it is easy to take chances. The difference between someone who does not take extreme occupational risks and tower climbers is that the slightest bit of error in their job could be fatal. It is not unusual that this risk usually comes with inadequate insurance. Another factor to be mindful of is location, which determines weather, which is another factor. 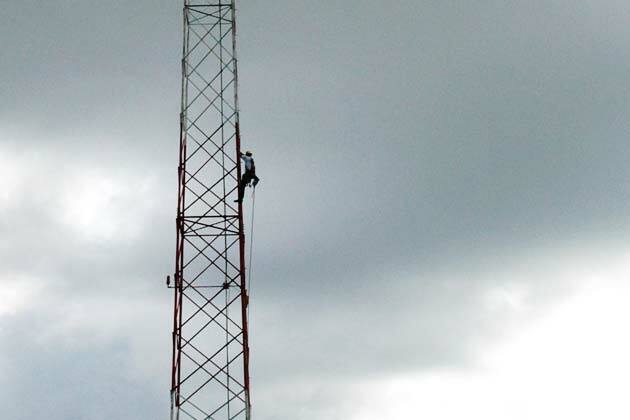 Regardless of the weather towers have to be climbed because consumers are not going to stop using their cell phones. As a matter of fact, nowadays people are using cell phones even more. There are more towers being built for the growing number of mobile telephone users everyday. And that is a good thing. More towers, more jobs. But the reality is that with so many opportunities, there are so many things to consider. For instance the weather, which is out of control of everybody’s hands. For instance, if you are not from California or working in California, the time of the year matters because there are some places where it snows or rains profusely that may interfere with the safety of the worksite. Many jobs are in the east and midwest where the weather is takes drastic turns. Tower climbers usually go out to the middle of nowhere to work. One of the bad things about that is if there is an accident on the worksite, most likely it would take longer for the help to arrive on the scene. When every minute saved or lost can make the difference between life and death, workers should have the security and comfort knowing that the most that can be done will be done by the employer to assist them and their crew. Tower climbing is a high demanding occupation. And it is very likely that it will remain that way in the future as growth and expansion of the wireless industry continues. The outlook is good, as long as everyone’s outlook is considered.